The cellist Louka (55) was long ago fired from the philharmonics for political reasons. On the eve of the velvet revolution, he makes his sparse living as a funeral-musician – for lack of money he also enters into a fictitious marriage with a Russian woman. Shortly after the wedding, the bride vanishes towards Western Europe – leaving behind her 5-year-old son Louka, who shows up one day on Louka’s doorstep. With great sensibility for the poetry of everyday life, Czech directing-talent Jan Sverak shows how the Russian boy and Louka form a tender bond. While the political situation grows more acute, the confirmed bachelor learns to take on responsibility. 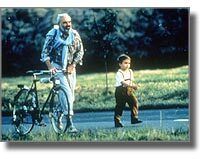 In 1996, KOLYA won the Academy Award for Best Foreign Language Film. Caligari: 12.04. / 10.30 a.m.